This page addresses some of the questions from producers about organic matter, soil organic carbon, the impacts of cropping on soil carbon, and the potential to sequester carbon under pastures. Organic matter is critical for healthy soils that support productive pastures. It makes soils resilient by providing food for soil microbes, provides a store of relatively available nutrients, and bonds soil particles for a stable structure. This organic matter includes living plants, animals and microbes, as well as litter on the soil surface and degrading and decomposing materials. Soil organic carbon is used to estimate organic matter levels. Organic matter is about 60% carbon, so soils with 1% organic carbon will contain about 1.7% organic matter. Most agricultural soils in Queensland contain 0.5–2.5% total organic carbon in the top 10cm of soil, which roughly equates to 5–25t/ha of organic carbon or 8–40t/ha of organic matter. That’s a lot of carbon and shows why soils are the third largest store of carbon on earth after oceans and geologic sinks like coal seams. Indeed, there’s 2–4 times more carbon in soils than there is in the atmosphere and about 4 times more in soils than in all the vegetation on the earth. 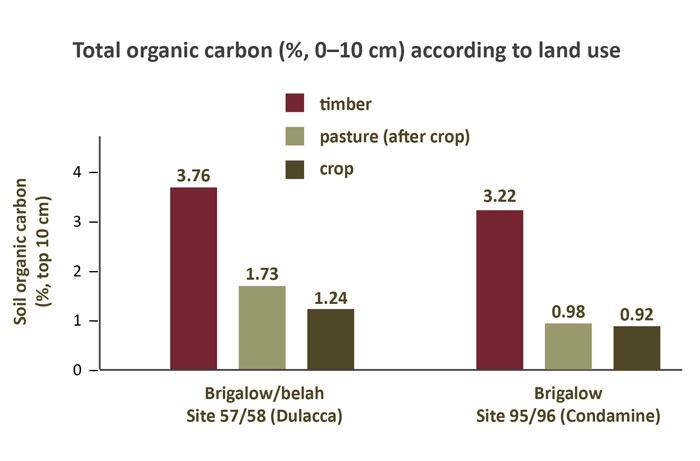 So while many people talk about planting trees, beef producers are interested in their ability to sequester carbon in their soils to improve their ‘carbon budgets’. Australia’s hot and relatively dry climate and the high costs of measuring soil carbon makes the current economics of sequestration difficult, but there are opportunities to increase soil organic carbon which will help and also make soils healthier. To recognise these opportunities we need to understand how carbon works and why we have the current levels of soil carbon. The level of organic carbon in the soil is determined by the balance between the amount of dry matter grown and returned to the soil and the rate at which the organic carbon in the soil is broken down by soil fauna and microbes. Consequently, soil carbon levels tend to be highest in cool wet climates where there is plenty of water to grow lots of dry matter and the cool conditions slow the rate of decomposition. Beef producers can increase soil organic carbon by growing the best pastures they can and returning more dry matter to the soil. In Queensland, much of this extra carbon will then break down in our warm conditions to benefit our soils (support soil microbes, supply nutrients, maintain structure) and improve our soil carbon levels. 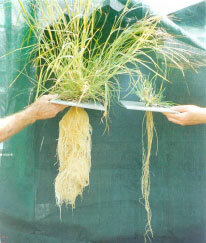 So, growing better pastures that produce more dry matter will sequester more carbon and make soils more resilient. considering phosphorus fertiliser to maintain production. These practices will maintain the health of perennial grass tussocks that would suffer and produce less dry matter if subjected to prolonged heavy grazing (Figure 1). Good grazing practices also minimise the erosion which can dramatically reduce levels of soil organic carbon levels by removing the topsoil into which most of the organic matter has been deposited. we harvest and remove product for sale. Soil organic matter levels will then reach a new lower ‘equilibrium’ for cropping where the dry matter inputs equal the continuing decomposition of organic matter by soil biota. Remember, the amount (or lack) of dry matter returned to the soil is a key driver for the declining levels of soil organic matter in our crop lands. We can maximise the amount of dry matter returned in cropping systems by growing as many good crops as we can, maintaining stubble and never burning or baling stubbles. Tillage and soil disturbance breaks open soil clogs and speeds up carbon breakdown to some extent. The major benefits of zero-tillage cropping systems in Australia come from growing more and bigger crops rather than from incorporating stubble. Forage crops that are grazed rather than baled will help maintain soil organic carbon levels because the dry matter is largely returned to the soil and not sold off-farm. Manures also help but break down very quickly and so we have to keep using them to maintain levels. We can also add charcoal or other ‘Char’ products which do lift the soil carbon levels but they are relatively inert and do little to improve the soil. Research confirms the best strategy for building soil organic carbon is to grow perennial pastures that have extensive roots and produce more dry matter. Data from the ‘Healthy Soils’ project again shows what is possible. 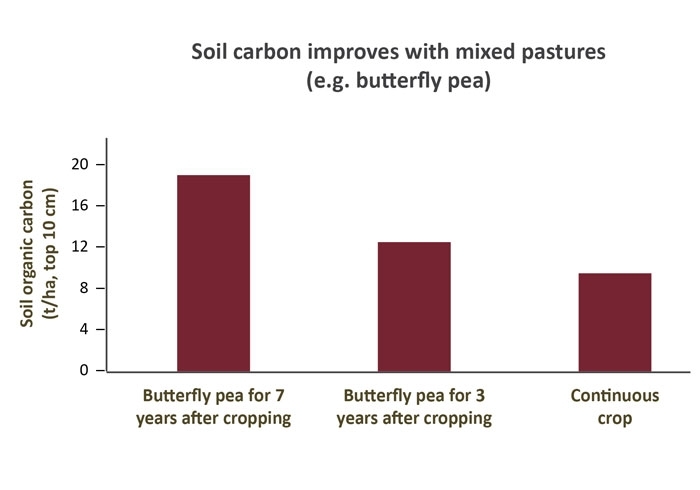 For example, the chart below shows the steady improvements in total soil organic carbon from 3 years and 7 years of a mixed grass and butterfly pea pasture on a heavy clay soil near Emerald. These pastures showed similar proportional increases in total nitrogen and microbial biomass and illustrate the potential for pastures to sequester carbon and rebuild resilience into these soils. To date, there has been considerably less data available from extensive grazing systems for comparing soil organic carbon levels and the types of organic carbon that develop under different pastures and grazing management systems. However, recent Department of Agriculture, Fisheries and Forestry projects funded by the Commonwealth FarmReady Industry Grants and by the Grains Research and Development Corporation and the Australian Government’s Climate Change Research Program are providing good local data on soil carbon changes across Queensland. 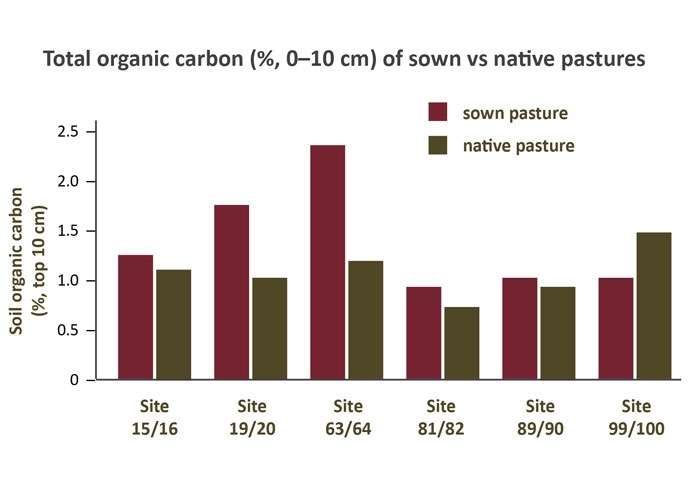 These projects are confirming that the ability of pastures to rebuild soil organic matter after cropping depends on the productivity of these pastures (Figure 3) and that sown pastures will often produce more dry matter and so have higher soil organic carbon levels than native pastures on the same soils…unless the soils have major nutrient deficiencies from poor cropping practices in the past (Figure 4). David Lawrence, Department of Agriculture and Fisheries, and Mike Bell, formerly Queensland Government.